How Do I Start a Radio Ministry? The story of David facing Goliath is an inspiration to all of us who are facing a Giant in our life! 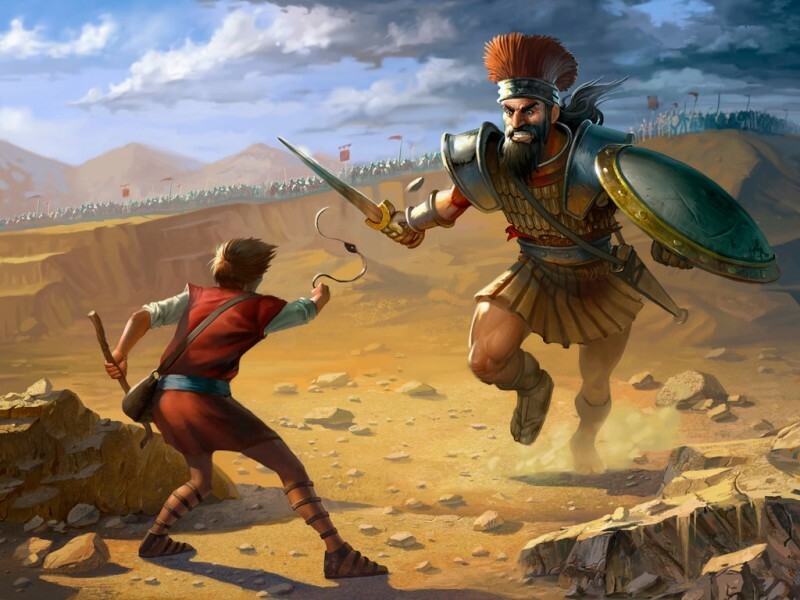 A great battle between a believer in the God of Israel, and a giant who trusted in the gods of the Philistines, shows us, if we learn the lesson that David learned, we can face any obstacle in our life. The lesson he learned was "the battle is LORD's". David put a smooth stone in his sling and hit Goliath in the forehead, knocking him to the ground, thus using Goliath's own sword to behead him! Life's Lesson: The giant represents the Devil, David represents our savior Jesus Christ. Jesus defeated the devil on the cross at Calvary. With our faith and belief in Jesus Christ, we can face any thing the Devil puts before us, because Jesus fights for us. The battle is the Lord's, not ours. We must fight, but Jesus gives us His strength and ensures the victory is ours. Samuel 17:46 This day will the LORD deliver thee into mine hand; and I will smite thee, and take thine head from thee; and I will give the carcases of the host of the Philistines this day unto the fowls of the air, and to the wild beasts of the earth; that all the earth may know that there is a God in Israel. Samuel 17:47 And all this assembly shall know that the LORD saveth not with sword and spear: for the battle is the LORD'S, and he will give you into our hands. One of the greatest lessons to learn is the Battle is the LORD’s! Walk in victory today and be blessed! 99.9 WUCC fm was started by divine direction of God. The Voice of Truth was the song playing while watching the movie Facing the Giants. To this day will still are facing giants. Looking at the cost of construction at $180,000 - Wow! I choose to listen to His voice! The devil says....You fill in the blank! But the Voice of Truth tells me a different story. This is for God's Glory! "The Voice of Truth" was performed by the University Parkway Church of God Mime Team. They came together In New Ellenton, SC at the Radio Station, where we had our "Meet and Greet" on Saturday April 21 and put together an outstanding performance.